This dental lecture and wet lab will provide 18.5 hours of dental-focused continuing education (including 8 hrs. with live horses). Course limited to 10 veterinarians. This equine dentistry lecture and wet lab will provide 18.5 hours of dental-focused continuing education that will immediately allow participants to put to practice what they learn. 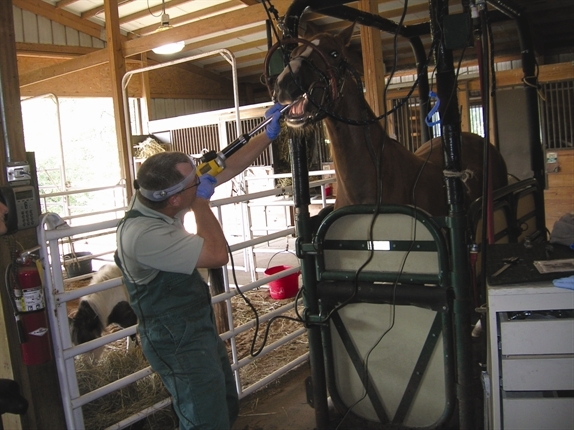 It arose from a desire to provide accessible, practical equine dentistry education to veterinarians. The wet lab portion will consist of 8 hours of live horse experience split over two afternoons. Participants will work as pairs on horses of varying breeds and ages. Powerfloat equipment will be provided but participants are also welcome to bring their own equipment. The dental seminar will be held near Union, Missouri, a small town approximately one hour southwest of St. Louis, Missouri. Most of the lecture and wet labs will be held at the Longmeadow Rescue Ranch, a large animal facility belonging to the Humane Society of Missouri. 12-veterinarian equine practice in Calgary, Alberta who continues to practice on a part time basis as well as develop ne modalities for equine dentistry. PowerFloat, a guarded right angle dental tool for horses that is now used world-wide. Dr.
Rach has lectured on equine dentistry in USA, Canada, Mexico, and Australia. through the AAEP over the past 9 years. To increase equine dentistry knowledge and technical skills so veterinarians can better meet their clients’ horse health care needs. Limited to 10 participants to maximize the wet lab experience. For more information or to be put on a list for registration materials, please contact Dr. Bruce Whittle at brucewhittle@gmail.com or the MVMA office at 573-636-8612. Hotel space is limited in Union, MO to the Super 8, phone number 636-583-8808. To receive the room rate of $89.99 you must make your reservation by August 8th in the "MVMA Meeting" block.